In the wake of the release of The Force Awakens, Bandai has given modelers a number of kits based on the new movie: T-70 X-wing, Millennium Falcon, BB-8, First Order Stormtrooper, and a First Order TIE fighter. The newest carnation of the venerable TIE fighter shares a lot with it's predecessor, such as the basic shape, the distinct twin ion engines, and dual laser cannons. Aside from the reversed color palette, the newer model sports a deflector shield, more powerful weapons, and an upgraded sensor array. The kit itself is molded in black and light grey plastic with the usual Bandai precision. Like all Bandai kits, it snaps together in a hurry and the final result is very nice, even without paint. I decided to tint the windscreen and top hatch glazing using Tamiya Clear Red (X-27) to mimic the the box art. I'm sure the red is due more to the lighting in the cockpit, but I'm not overly concerned with screen accuracy and I don't light kits so this is the next best thing. I wanted to go with a weathered look on this TIE fighter because the First Order no longer treats its personnel as expendable, given that their ships are shielded now. It makes sense that these fighters would see considerable action and over time would accumulate wear and tear; this particular TIE is being piloted by a veteran Special Forces pilot and has seen plenty of combat. 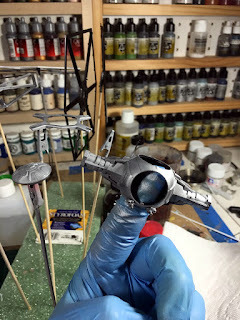 After priming with Alclad grey primer, I gave all of the hull and wing frames a coat of Alclad Dull Aluminum (ALC-117) and then applied Humbrol Maskol with a small piece of torn foam where I wanted the chips too be. 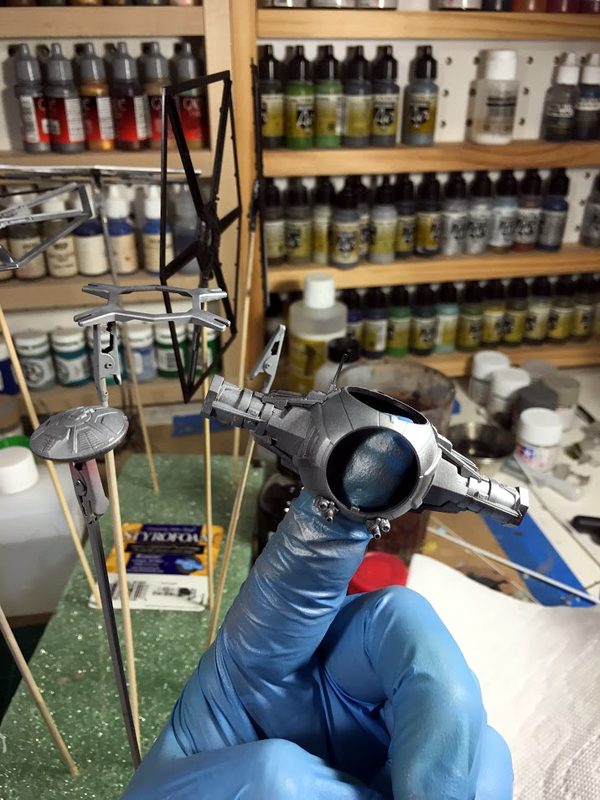 I then gave the entire ship a coat of Tamiya Rubber Black (XF-85), which is a nice near-black color. After the paint cured I used a piece of poster tack to remove the liquid mask, revealing the metallic color underneath. Because Tamiya paint is so matte, the Dull Aluminum was too bright and I decided to give everything a light dusting of Rubber Black to tone it down a little. The wing panels were painted with a 12:1 mix of Tamiya Flat White (XF-2) and Sky Grey (XF-19), which is much lighter than the grey they come molded in. I need to figure out how I'm going to further weather the model. Normally I would do this with oil washes, but given the almost-black color, I'm not so sure that would work out well. I might give everything a light drybrush with some grey oil paint, but I'm not sure how that will turn out. While I think about what to do, I'll start working on the cockpit tub so I can get the main hull assembled. Great idea on the red tint ... 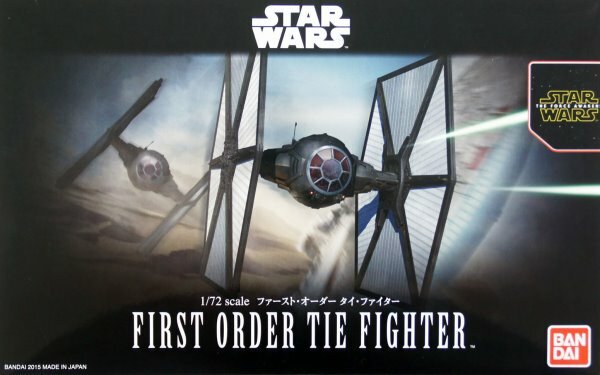 I think I will try it too on my FO Tie Fighter when I get to it. Weathering it is indeed going to be tricky, especially intact and airborne. I think it would be much easier to weather if you're doing a diorama on a crashed version.